The class representative called from in front of the teacher’s desk. Things like cafe, play, haunted house, and arcade were written on the board. The cultural festival was approaching. Once it came to light that our class may not decide in time, this half-hearted meeting was called right after homeroom. I was quietly watching over the proceedings. Members of humanities clubs at our school weren’t deeply concerned with the classes’ offerings because they were far busier with those of their club. Some schools would have offerings from sports clubs, but ours didn’t. Inevitably, the classes’ offerings focused on the sports club members and the going home club’s. Of course, us humanities clubs would help, but the main focus, and thus the students that were busiest were from those two categories. I raised my hand at the cafe, but the class as a whole voted for the play. My classmates began chattering about the play. Normally, something would be used for inspiration, like Cinderella, Snow White, or some fairy tale because it made things rather quick to arrange. The students were amateurs and would struggle to memorise the lines too, so I thought a full play would too difficult. With my mind occupied with various thoughts, I didn’t open my mouth. I would have a minor role in the end, and everyone chose the best ways they could help. At the girl’s suggestion, the class’ focus shifted to an original script. I guess they were all getting excited about the cultural festival because it only happens once a year. But I worried if this would be okay. I thought a completely original script would be difficult. In the first place, what would we do about making the entire story? But of course, I didn’t say a word. This was an opportunity for everyone to give their opinions, I didn’t want to rain on their parade before we decided anything. A girl that had spoken to me maybe three times pointed at me. The class started booing at me and Sakai started cackling in a corner because he knew that I couldn’t write stories. I glanced at the seat next to me and President Minekawa was glaring at me with a frown. What, even she thought I should be writing it. I refused to write it, so we ended the day just having decided to do a play and with the understanding that each of us would think over what kind of story we wanted. It was a rather grim outlook. Eina: Good evening, Shuu-san. How are things going? Eina: Ah, for the cultural festival edition? You managed to get submissions this time. Shuu: It’s the third years’ last chance, so they always contribute. Eina: Huh, Shuu-san, you seem down today. I was taken aback. My feelings were in the writing? Was that a thing? Shuu: There’s just an annoyance. It’s nothing big though. I told her about the class meeting after school. Eina: They booed you for not writing a script? That’s awful! Shuu: I shouldn’t have given them expectations. Eina: You didn’t do anything wrong. Eina: Shall… I write… the script. Eina: Yes, I’ll give it a go! Shuu: You must be busy though, right? I said that, but I realised then that I knew nothing about her everyday life. Eina: I’m not. I don’t go to cram school and I’m not in a club. I’m free every day, so I think writing would be much more useful. The next day after school, I stood in front of the teacher’s desk. One of the boys said to me. When I said that, the classroom filled with noise. The class representative took a vote, the majority of the class voting to do so. “Thanks. So, what does everyone want from it? Requirements will make it easier to write, so give me any ideas you have,” I asked. I took notes of what everyone was saying. I could tell the class was getting their hopes up. In honesty, so was I.
I would be able to read Eina’s next work. I was looking forward to that on its own, but it’d be made into a play for the class, I couldn’t help but get my hopes up for that. I guess I am helping the class a lot this year, I thought. The literature club had more members than me, when they gave me the materials, I could focus on the class’ offerings. The third years were also studying for exams, so all of them would pull together for their classes, it was a mutually beneficial relationship. And because of that, I had sole discretion over how the literature club’s preparation was done. The club would need to print the booklet, bind it and place them for distribution. It was okay, I could do the editing at home. I could do the binding after the classwork was done in the clubroom. And if I did my best the day before, I could get the decoration done too. Sakai puffed up his chest at his insight. “I wonder about that,” I dodged the question. With that kind of questioning, you couldn’t answer with a yes or a no. That itself would give him information. A no would at least let him know that she wasn’t in our class. “It’d be dangerous to be your friend if I was loose-lipped, you’d be able to write about anything. He was glancing my way, but I had no intention of talking about Eina. Besides, I didn’t know anything about her to tell him. Eina: Shuu-san, how did today go? Shuu: I did the normal editing stuff. 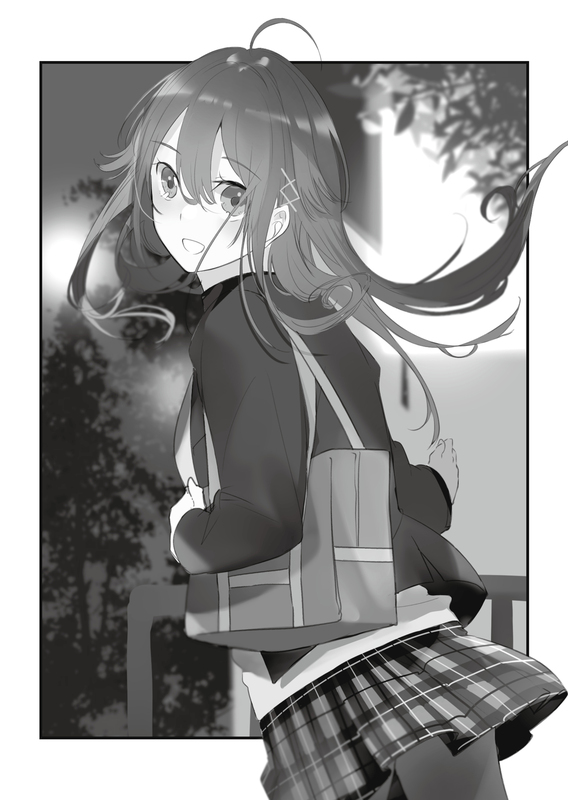 I got the illustrations and cover design from Ruka-senpai so I’m compiling the data. Eina: Oh! Do your best! Shuu: What about you? How’s the script? Eina: I’m drawing up a plan! Shuu: Okay, let’s both do our best! Eina: What kind of day did you have? Shuu: I went to school, then did editing afterwards, same as always. I’ll want to help the class before the cultural festival, so I thought I’d get the literature club’s work done now. Eina: You’re a hard worker, huh? Shuu: I’m not, I only work hard at things I like. Eina: That’s still pretty amazing. Shuu: Thanks, so what’s the script like? Eina: Uhh, it’s getting there. Shuu: Everyone’s looking forward to it. So am I. Do your best. Normally, I’d always be getting messages from Eina, but I hadn’t received any in the last three days. That’s why I sent a message myself after school that day. Shuu: Hi, how are you? What was wrong, I wondered, usually I’d get a response immediately. Maybe she was busy with her own school’s festival? At the thought, my phone buzzed. Eina: Hi, how did your day go? Shuu: I finally finished with the data for the booklet. Now I just need to buy paper and print it. Eina: Umm, ah, umm… I’m doing my best. Shuu: When do you think you’ll be done. The replies paused again, and the next message was that evening, before I slept. Eina: I think it’ll take a little longer. I guess writing a script and a story really were different. I’d thought that she’d be able to write a full book in about a week seeing as she’d written a short story in a single night, but it might be a little difficult. Actually, we needed to decide who had what role. Shuu: Could you send what you’ve done so far? If you do we can make props and costumes and decide who’s playing who. And then, Eina sent a shocking message. Eina: I still haven’t written a single word. I shouted in my room. Not a single word? Why? No, I don’t have time to find out the reason. This was serious. I doubted she could write the play within the fortnight remaining, besides, then it would be too late. My eyes span as my thoughts whirled. Another message appeared from Eina and I realised I had left it marked as read without replying. Shuu: Sorry, Eina. I forgot to reply. Okay, then I’ll tell everyone it’s too much and that it’s too hard to write an entire play in time, I’ll find something else. Shuu: It’s okay, they’ll understand. You were a volunteer in the first place. My phone gave two long vibrations. It was a call from Eina. Eina was crying. Her voice was shaking, she was sniffling, and weeping over and over again. I was flustered, maybe I shouldn’t have sent the refusal all of a sudden. She might have thought I was angry. I couldn’t find the right word. This time I managed to speak. I truly meant it. It was really fun speaking with Eina. That was why I was sad when I didn’t hear from her for the past three days. At some point, chatting with her had become part of my life. Eina sounded like she wanted to yell, and burst into tears on the other end of the phone. The rules, to avoid knowing as much about Eina as I could. So I couldn’t narrow down who she was. I wanted to know about her too. I could imagine it, a girl hiding in the covers on the phone. She was different from the people around her, but at school, little differences could be treated as heretical. You could call it bad luck, no one understood Eina at school. The smartphone creaked in my tightening grip. I wanted to go right over to her and hug her. But I couldn’t. There were five years separating us. But at least I could make her understand. She burst into renewed tears. She really did cry a lot. But… it might be for the best to let her cry. It was fine to cry when you were happy at least, right? Eina understood. Understood that you never knew when your happiness would be destroyed. That’s why you had to treasure the happiness you had. She had stopped crying, and Eina’s voice whispered in my ear. I couldn’t have seen her face. But still, I felt like I could see her smile. When I woke up that morning, I’d gotten a message from Eina. My entire body flushed with heat. Shuu: Thanks, now we can start preparing for the play. Sorry for rushing you. Eina: I just couldn’t stop once I started writing! Shuu: Eina, you really do have a talent for this. Oddly, I didn’t feel jealous. I was just happy to be able to read what she had written. Immediately, I transferred the file to my laptop and printed a copy. Reading something in depth really was better on paper. I put the script in my bag and headed to school, sat in my seat, and immediately began to read. As they arrived, my classmates and friends gave greetings and struck up conversations, but their voices seemed to come from far away. Perhaps because she was conscious it was a play, it was completely in the fantasy genre. You could call it a fairy tale. The protagonist was a teenage girl, bullied by her mother and elder sister, with no friends, living in despair. At the hopelessness of her own life, she went to end it. However, a wounded demon suddenly appeared before her. He had been persecuted by humans, and the kind-hearted girl instinctively treated his wounds. The demon said that he would grant her wish in thanks, and that she must pass three trials. The first trial was to go alone to a cave in the mountains and retrieve a treasure chest. The second was to go to her terrifying mother’s room and steal the key. And the third, the third was to use the dagger in the treasure chest and offer a sacrifice to the gods. And placing the dagger in her hand. However, the girl refused. Using magic, the demon controlled her hand, and made her stab him in the chest. The grieving girl thought of using the wish to resurrect the demon. If she did that, she would have the same life as before. No, it might even be worse, but even so… the girl resurrected the demon. Upon his resurrection, the demon was transformed into a human. He was actually a cursed prince, and the girl’s kindness along with the prince’s feelings had caused a miracle, breaking the curse. I raised my head and the English teacher was looking down at me. I’d not noticed him approach at all. I could hear the other students laugh, apparently the lesson had started before I’d noticed. I hurriedly took out my textbook. But, what was I supposed to do? “Page ninety, translate the second line,” came a voice from my side. It was the President. She was looking at me in almost a glare, with a frigid expression. I gave a shiver and opened the textbook. Fortunately, the English wasn’t too hard and I translated it without incident. The teacher moved on to the next student and I returned to Eina’s script. This time with a red pen to correct it. Finally, I had read over the entire thing at least twice. When I raised my head, I met the eyes of the third period’s maths teacher. The class dissolved into gales of laughter. “I am?” I asked in return. While we were talking, the class representative appeared in front of the teacher’s desk and the class meeting had begun. The script had arrived so we were genuinely beginning preparations for the play. I’d printed the script during the lunch break and given everyone a copy. Today we would be discussing who had what part. That of course referred to the characters, but people would also be assigned to costumes, props, the set, everyone in the class should have something to do. People with nothing to do for a while would probably help with things that weren’t finished, but it was still important to assign responsibilities. People would put themselves forward and the roles would be decided. The costumes, props, and set were all filled without issue and all the supporting roles had been decided. I was helping with the set. I wasn’t particularly skilled with that kind of thing, but I figured I could help with the physical work. All that was left was the lead role and her opposite, the demon prince. It was probably because the script had a straight up romance between them, so everyone was embarrassed and didn’t want to do it. There was even a kiss scene. Though obviously they wouldn’t do it for real. Then, I heard a chair move back next to me with a clatter. The President had stood up straight and then she said. It was unanimous. I thought she worked for the protagonist too, her beauty fit the impression of an ephemeral girl perfectly. The class began to clamour. Chatter came from all over the room. I realised everyone was looking at me, and I was so surprised I couldn’t say a word. “He’s the one that talked with the author, so he’s the one in the class that understands the play the best, and so he should have the prince’s role,” said the President, looking down at me with cold eyes. It almost seemed like she was saying it was my duty. The class all started to fall in line with her opinion. I couldn’t refuse in that situation, and I could only nod. Sakai slapped me on my back on our way out of the school gates. Sakai was practically skipping while I trudged along. I said, before letting out a weary sigh. That itself was why I was worried. Fair arguments weren’t always kind to people. I did think she was pretty, but I hadn’t thought she was that popular. I wanted to think that my face heating up was my imagination. Eina: You’re the prince! Waaah, that fits perfectly! I could tell from just the text that she was excited, but I didn’t really get what she meant. Shuu: I’m just a normal high schooler though? Eina: It’s a perfect fit. I mean, I modelled the prince after you, so having the real person play him makes me really happy. If Eina’s going that far, I’ll do my best, I thought. I immediately took out the script and read it aloud. Just reading it wouldn’t let me know if I was doing well or not, so I used my phone to record myself. I was so bad you couldn’t have even called me a ham actor. I cycled off to a bookstore that was open at that time of night. After school the next day, we had the initial rehearsal. My study was in vain and my acting was still tragic. Actually, it was about the same level as those in the supporting roles, so it was probably about normal for someone without experience. But I had a leading role, so this was awful. “There’s still time, you’ll manage, right?” Sakai said to me, but it was no consolation. The President was absent, apparently she had to do some work with the cultural festival as a whole. Disappointed, I headed to the literature club’s room. The end of the day was approaching, but I wanted to do some preparations for the literature club. We planned to have the room open on the day itself and distribute the book, so I had to decorate the room. However, I couldn’t move my mind from the acting and didn’t get much done. “Literature club.” I started in surprise at suddenly being spoken to. The President was standing in the doorway. I apologised reflexively. It was already long past the end of the school day. “Am I really that scary,” the President sighed. She seemed to be a little down, and I felt slightly guilty. I might have misunderstood what kind of person she was. At that moment, I was alone with the President, walking through the twilight. We couldn’t stay in the school, so we were heading to a nearby park. We didn’t talk much, since she would only say what she had to. I glanced at her. As usual, she was frowning. She really was amazing for managing to look beautiful even with that expression. But would we actually be able to practice in this atmosphere? A metaphorical life-ring was thrown out to me as we arrived when my phone vibrated with a message from Eina. Eina: Evening, how are the cultural festival preparations going? Shuu: Good timing! Are you free now? Can I call? Eina: You can, but why? Shuu: I’m actually about to practice with the President, but… it’s uncomfortable. Shuu: It looks like the President hates me. Eina: You’re practising together even though she hates you? Shuu: Yeah. I’m not good at acting, and she was busy with the student council. She’s not the type to mix personal feelings with business. Shuu: Yeah, but she can’t hide her bad mood, so could you listen to us practice and give some comments. It’d be easier than doing it on our own. I called Eina and put the phone on speaker mode. I put my things and phone on a bench and faced the President with the script in hand. Her expression changed to one of heartbreak. As if she were about to cry, but was desperately holding back the tears. She was just looking downcast and haltingly saying her lines, but her sadness and pain really were conveyed. I came back to myself at Eina’s voice from the phone. We finished the scene and the President looked steadily at me. Eina’s kindness actually felt all the more painful. The President telling me that calmed me down a little. Did she mean she stayed up all night? She should be awfully busy as the festival approached. “A cola,” she murmured in response. I left my phone on the bench and walked to a nearby shop. Because it was dinner time, the cashier was crowded and it took longer than I thought to buy the drinks. Once I was done, I ran back to the park. The President was sat on the bench talking to my phone. Rather than her usual dignified air, the President seemed like a normal girl, which was a new experience for me. Wait a minute, go home together? With the President? Wouldn’t that be really uncomfortable? But Eina had already hung up. We walked off, drinking from our cans. We both fell into silence. Damn, this was indeed really uncomfortable. I didn’t know what to talk about, and as usual, she didn’t seem like she was about to speak to me anytime soon. Why did Eina say I had to walk her home. We’re not lovers or anything. The next time we spoke ended up being when we arrived at her house. I couldn’t help but start to ask. We had arrived at an orphanage. It was a small building that looked like a small school on the face of it. “Are you surprised?” She asked. The President looked at the orphanage building as she spoke. Her face was strong, refined, and above all, beautiful. I really don’t know anything about her. “Literature club, do your best in the festival,” said the President, with a much gentler face than usual. The President disappeared through the door. Her last words were nearly soundless. I smiled, thinking I wanted to know more about her. Night had fallen and I was relaxing in my room after a meal and a bath when a message arrived from Eina. Eina: That the President doesn’t hate you at all? Eina: We talked about a lot of things when you went to get the drinks, but it seems that the President treats you harshly because she’s nervous. Haha, being popular sure is tough! My face flushed with heat. Eina: This is a confession event! When you’re going home from the festival or something! It’s wonderful, isn’t it? It’s like you’re bound by fate with your co-star. When I was told the President might not actually hate me, and that she might even like me, I was started panicking, confused. And then I realised. I was panicked that Eina would misunderstand my feelings. Eina thought that I liked the President, and was honestly supporting me in it. But that seemed too lonely to me. Shuu: I just look up to the President. She’s pretty, but I don’t think I exactly like her, so I won’t confess. Eina: Eh? I-I see… that’s good. We both stopped messaging for a while. Shuu: Let’s go to sleep. The next fortnight flew by. That morning, I went to school early and we practised for the play. I was half asleep through class, and after school, we had another rehearsal. While we rehearsed, our classmates were around the room making costumes and props. Suddenly, a huge crash sounded along with the noise of breaking glass. The sound team were picking out music and sound effects. There were even people making spotlights with torches and cellophane. This kind of scene was happening all throughout the school. The entire place was getting into the swing of the cultural festival. To use a common saying, they were fulfilling days. But for some reason, I felt dissatisfied. I didn’t know why. I had an odd lonely feeling, like a small hole had opened up in my heart. However, there was so much to do that I didn’t even have the time to think about it. I had to spend any free time I had binding the books for the literature club. And then it was the day before the festival, Friday. After school, I figured that the class could do without me for a while and headed to the clubroom to decorate it. It was already completely dark outside but for today only, the teachers wouldn’t say anything if we were here late. When I arrived, Ruka-senpai was already there. She was on top of the desk, trying to hang decorations on the blackboard, but she couldn’t quite reach. She was stretching out so far that it looked like she might fall. I switched places with her on the desk and hung out the decorations. She didn’t look too happy about it, maybe she’d been hoping I would give her the excuse to skip. Ruka-senpai left with the flopping of her footsteps. The others had mostly finished already, I just had to create the venue. I put several desks together like a bar, lay a cloth over the top of them and arranged the bound books on top of that. It wasn’t just the books for the festival, we also put out older books too for anyone interested. I finished and let out a long breath, looking out of the windows. The school had already fallen quiet, most of the students had probably gone home. The sky was pitch-black, with stars dotting it. I wonder if Eina is looking at the same stars, I thought idly. The Eina I talked to was the Eina from five years in the past, so she couldn’t be looking at these stars. But… what about the current Eina? Was she, on the same planet, at the same time, looking up at these stars. I took out my phone. I’d not had any messages. I was really busy at the moment and couldn’t reply much, so Eina and I hadn’t talked much recently. Sliding my finger over the touchscreen, I called her. It rang once and she picked up. Eina was completely right. Recently, my life had been surprisingly fulfilling. Eina wasn’t here. I didn’t know her face, her name, or even her age, but I still felt that she should be next to me. I wanted to meet her. If we were just a long distance apart, we could still meet. I could get the train, or even a plane. But the interval in time was insurmountable. I thought that maybe Eina felt the same as me, and I quietly held her voice in my heart. We were silent for a while, utterly wordless. But my heart was at ease, maybe because I knew I was connected to her through my phone. She wasn’t beside me, but I didn’t feel alone in the slightest. 《Umm…》 we spoke together before falling into silence waiting for the other to continue. I didn’t understand what she meant. I really did have to head home soon. Our voices mixed with the electronic tone as we hung up. Even after hanging up, my gaze lingered on my phone for a while. It was the day of the festival. I did some preparations for the club and then headed to the classroom. The classroom was a tumult of noise as people bustled about doing makeup, preparing costumes, and coordinating lighting equipment. I searched for the President, wanting to go over things one more time, but I couldn’t find her. “Is the President still with the student council?” I asked Sakai. He made an unusually serious face as he answered. I made a mixed noise of shock and doubt. “Hasn’t she contacted you?” He asked me. A girl cried out from the door. I looked to see the President slowly entering the room. But she only gave the girl a glance and didn’t answer. No, she did, her mouth moved. However, her voice didn’t reach me. I had a bad feeling about this. She approached and I could faintly hear her voice. But it wasn’t her usual clear soprano, her voice was hoarse, and if I hadn’t seen her speak, I wouldn’t have known whose voice it was. Her eyes were swollen and her cheeks were flushed. She obviously had a fever. Even the way she walked looked more like she was being dragged along. “Sorry, I didn’t sleep last night and I’m tired. It looks like I caught a cold as well,” she confessed. “That’s because I’m always trying my best,” she managed to get out, before breaking into a hacking cough. What should I do? It didn’t seem like she couldn’t speak, but acting with that voice would be quite difficult. Immediately afterwards, he was dragged away by the girls. “Hey, literature club, can you contact Eina-san?” The President asked hoarsely. I called Eina, just as she asked. “It’s the President,” I told her. The President’s expression seemed to ease as if Eina’s words put her at ease. She said with a calm expression. If the original author said so, then that would work within the fiction. “That’s fine. She’s lacking in feelings and suffering. I know that you can do it,” the President said, before she started to choke. The girl in charge of costumes and makeup slapped my shoulder. I took a sidelong glance at her. She was already dressed up as a shabby girl and looked ephemeral, as if she might disappear at any moment. Even dressed up in such torn up clothes, she was still charming. She was there quietly, with her eyes on the script, going over her last checks. I spoke to my phone where it had been placed by the sound system. She returned energetically with a voice containing no hint of nervousness. I can’t be the only one nervous. I let out a long sigh and straightened myself. “Right, we’re starting!” Came the class representative’s yell as the President ran on stage from the wings. A cheer greeted her onto the stage. Eina’s line echoed throughout the hall. Even though her voice was going through a sound system, it was still beautiful. It was a perfectly clear, lovely soprano that was nice on the ears. And then I headed onto the stage. The classroom had been remodelled into a hall and was filled to capacity and I was overwhelmed by the greater number of spectators than I had expected. I was then on the stage for the rest of the play. Throughout the first and second trials, the President and I, along with Eina, played our parts… with no major mistakes. And then, finally, it was the third trial. As I spoke my line, I handed over the dagger prop to the girl, to the President. However, I couldn’t hear Eina’s voice. Silence fell over the hall. I glanced into the wings, and our classmates were panicking. The audience didn’t seem to have realised anything was wrong yet. What’s wrong, Eina? Why aren’t you saying anything…? I went to speak but suddenly gave up. I shouldn’t think of Eina’s feelings, I should think of the character on the stage’s feelings. What would the girl be thinking? She’d be happy wouldn’t she? At feeling his love. And then it came together. She was so happy she couldn’t get her feelings out. No sooner had I repeated the line, tears welled from the President’s eyes. Those tears might have been an illusion I was under. It was as if Eina was in front of me, standing with me on the stage. I felt sorry for the President saying it like that, but I saw the President as Eina. 《I can’t think of a life without you. I want to be with you.》 Eina gave her line in response to mine. Now we were heading straight for the happy end. Once the play had ended, Sakai came bounding in from the wings. Sakai handed over an SD card. Sakai had recorded the play on his phone. He was a reporter for the newspaper club, so he had to watch it himself, so I had him record it at the same time. “Oh yeah, why’d you not get Eina-chan to come? It would have been better in person, wouldn’t it?” Sakai asked. He was probably asking such a leading question because he wanted to know who she was. Even if I would, I don’t know anything about her. “I’m going to the literature club for a while,” I said and left Sakai behind. 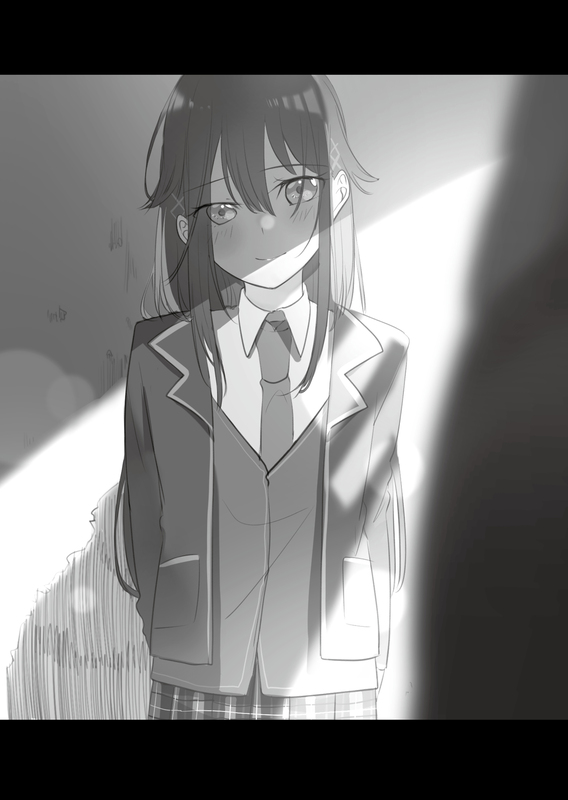 I rushed towards the clubroom to shake off the heart-rending loneliness. On the way, I sent the recording to Eina. After a while, I got a reply. Shuu: Was it not how you imagined? Eina: I saw your face like this. That’s right, this was the first time she’d seen my face. Shuu: Did I ruin your impression? Eina: Not at all! It was sort of… exactly like I thought… It was just like you! At that Eina-like comment, I felt my heart warm. It was the last day of the festival. Our school had an after-festival, limited to current students. They used a stage in the gym, had a volunteer band and a pro-wrestling show in the hall. I wasn’t the type to go and party, so I was sipping a drink in the corner of the hall, absently watching the festivities. There were many others doing the same, so I didn’t feel alienated. “Literature club.” Someone clapped me on the shoulder, it was the President. “It’s not like I do all of the work,” she replied as loudly as she could. The band was booming through the hall, so I felt kind of sorry for her. I gestured outside with a glance and she nodded. We left the gym and went behind the hall. The night wind was pleasant. The President had ended up performing twice, the morning before and that afternoon. On the second time, her voice had gotten much better so she had spoken her lines herself. It was unfair to the President, but I was glad to be able to participate in the cultural festival with Eina, and she was happy for it too. It was a lucky break for us. Of course, I wouldn’t say that to the President, I couldn’t tell her that her getting a cold she had to struggle through was a ‘good’ thing, and it would have been rude to her acting too. But I really did want to let her know that she hadn’t caused any trouble. “Thank you for your amazing acting, you really did well,” I said, and she looked away, her face slightly red. The President ran off as if hiding her face. She is cute sometimes, I thought. I didn’t go back into the hall and instead stood in the night wind for a while.